With RAT GIRL about to close on May 24th and THE CRUCIBLE about to open on May 20th, Stuart Bousel finds himself in the rare position of not only having two works playing simultaneously in San Francisco, but both being works based on true stories (that interestingly enough, also both took place in New England, and both focus heavily on teenage girls). Paradoxically, one is a new work being tested for the first time (RAT GIRL), and one is a great American classic that’s been done many times (THE CRUCIBLE), and while he penned the first one (adapted from the memoir by Kristin Hersh), he directed the second (which is written by Arthur Miller). The juxtaposition of these two works has certainly generated a great deal of introspection on his end, particularly in regards to how we tell a story, and why, how it is received and what expectations audiences and critics walk in the door with, what we bring to a production process depending on our role in that process, and what roles truth and reality play in making a work of art, whether we’re breaking new ground or re-visiting a well trod path. Though there is, no doubt, a whole other article coming discussing his experience of inhabiting two such different (and yet oddly similar) worlds at the same time, for the moment it seems like the best way to offer a window into his mind is via the notes he wrote to accompany these two unique shows. Kristin is a real person. She’s a mother of four sons who divides her time between New England and New Orleans, and when she’s not being a mother, writing songs or touring the country with her indie rock royalty band The Throwing Muses, (or her more recently formed punk rock trio, 50 Foot Wave), she’s working on more books and co-running a non-profit to empower more aspiring musicians. The fact that she took the time to personally respond to my ridiculous request to turn her book into a play is a high-point of my life, let alone the part where she gave us the permission to create this show and put it on. But from what I can tell, that’s Kristin: generous, benevolent, all about people pursuing their passions and quick to say “hey, we’re all losers here.” By which I’ve come to think she means we’re all human, all struggling with something, and that’s what’s interesting about us, even if some of us happen to also be rock stars. I originally conceived and pitched this show as a piece about the relationship between Kristin and movie star Betty Hutton, who had relocated to New England in her 60s to “dry out” and pursue a masters degree at Salve Regina University, where Kristin’s father was teaching and she was also a student. But like so many shows it evolved into something else, but with the added element of being based on historically true events and the lives of people who actually lived and not only that- lived in the public eye. One of my major challenges in the process was balancing the source material (the book) with all the outside historical information, trying to stay true to what happened and who these people were, while still trying to turn it into a dramatically viable play abut people who anybody could potentially relate to, while also trying to unpack the exquisite mystery that is Kristin’s music and her love/hate relationship to it. At some point I realized the second two values trumped the first, and the drafts got a lot better after that, if less reverent. Luckily, my two heroines are neither reverent, nor people with a conventional relationship to reality. But they are all real people- down to the reporters and the students in Kristin’s art therapy class. Betty (about whom Kristin wrote the song “Elizabeth June”) died in 2007. Tea is Tanya Donelly, who would later leave the band to form The Breeders, then Belly, and then go solo, becoming an alt rock icon in her own right. Gary is Gary Smith, of Fort Apache Records, Ivo is Ivo Watts-Russell, who founded 4AD Records and has a Cocteau Twins song named after him, and Gil is Gil Norton, a now legendary record producer whose discography reads like a Who’s Who of the last thirty years of rock music. Leslie has retired from music and returned to California, but Dave is still Dave, touring with the Throwing Muses, sitting at the drums behind Kristin, not wearing his glasses. Mark has also died since the events of RAT GIRL, but the details around his life are always fuzzy. Numerous lyrics in songs by both Kristin and Tanya seem to reference him, this gentle, kind boy who was living under a porch for a while, but unlike so many of the other people in RAT GIRL, he was never part of the music industry or larger art world, and so he has the rare luxury of being a private citizen who has remained, mostly, part of Kristin’s private life. Along with Betty, Kristin dedicated the book RAT GIRL to him. As a new play is developed, many things come and go. What you’re seeing on stage is something between draft 4 and 5. My first draft was incredibly reverent of the material and four hours long. With each draft, material has been cut, while subtle things changed or were added, put into my own words, or morphed together from Kristin’s. In the case of the character of Jeff, who is a major figure in the first half of the book, at least three other people have been collapsed into him, and Kristin’s parents, so important in the memoir, are now just voices from the past. Still, it was the last cut I made, a week before previews, that I think stands out most in my thoughts on the process. It is the final line of the book and was to be the final line of the play: “I absolutely did not invent this.” In the book, it’s Kristin talking about her first born son. In the play, it was to be the summation of everything the audience had just seen. But with each draft it felt less and less necessary as the play truly became a play, something apart from the book, from the music, and from Kristin’s actual life, a story about a young woman who could really be anybody, any of us. She just happens to be named Kristin. 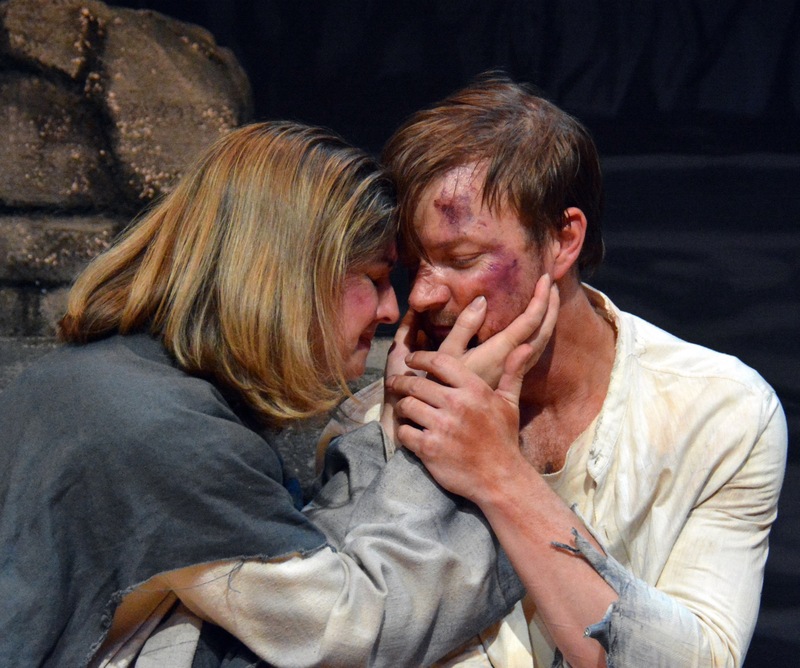 Note: it’s probably helpful to know this production is staged on a floor painted with a map of the Salem area of Massachusetts in 1692, and that this was the foundation concept behind this particular production. The decision to place this production of the Crucible on a map of Salem Town and the larger, more ambiguous region known as “Salem Village” came from a desire to communicate to our audience that what is often perceived as an event taking place in some quaint, cobblestoned seaport, actually took place over almost 100 square miles of farmland and hamlets that would later become what is present day Beverly, Andover, Marblehead, and Salem. With roughly 2,000 residents in 1692, Salem Town was the second largest settlement in New England (after Boston), but the home of Reverand Parris, where the witch hysteria began, was located 7 miles away, at a crossroads where 10-15 buildings and homes had clustered together to form the center of an agricultural parrish over which 500 or so farmers and craftsmen were scattered, living the majority of their days in relative isolation save for their own families, servants, and hired farmhands. Their once a week journey to the parish center for Sunday prayer at the meeting house would have been the bulk of their social interaction with people outside of their households, and for many this would have been a trip of several hours, often on foot, through fields and pockets of forest in which Natives Americans and wolves prowled. In winter they could expect anywhere between three to nine feet of snow, and very little by way of highway maintenance. Households in the parish had to be largely self-sustaining and also defensible, especially in a time when marauding bands of French soldiers were attacking villages and farms along the Maine borders, and even one’s neighbors were more likely to be strangers than friends. News was communicated slowly, by foot or by horseback, medical aid was difficult to obtain in a timely fashion, and firewood was arguably more precious than gold since it would have to be dragged a great distance and obtained from the source rather than in a marketplace. Candles, the primary source of indoor light, were expensive and used sparingly, windows heavily curtained in an effort to insulate houses made of wood and stone. The cliche of small towns where people lived their lives within five miles of the house they were born in is not only a truth about Salem Village, but intrinsic to understanding how something so incomprehensible as the witchcraft hysteria could have happened. Isolated from one another and attempting to eke out a living under harsh conditions, perched on the edge of a strange continent only barely explored, it’s not hard to see how an avid and culturally ingrained belief in demons and angels could morph into something diabolical when combined with the active imaginations of people living in places where the night-time darkness must have seemed impenetrable, the shadows full of dangers, the chill weather deadly, and help far away, if it existed at all. That these people had come to New England in search of a new and better life, usually in the form of land ownership that was impossible in the Old Country, is further hinted at by the map, which was continuously re-drawn with each generation as farms failed or succeeded, families grew or died off, and disputed territory was correctly or incorrectly designated in wills or via private sales often occurring outside any kind of formal and enforceable legal process. It has been argued that a principal motivation behind the witch trials was one faction of families, lead by the wealthy Putnams, seeking to acquire the land of those they accused, but in reality the land of the accused rarely became available to private buyers, reverting instead to the state. Long standing disputes over land, and the resentments attached to those disputes, however, most certainly fanned the fires of personal grudges that combined with the miasma of paranoia and resulted in nearly 300 people being arrested on false charges and 25 people losing their lives- 19 by hanging, 1 by being pressed to death, and 5 by sickness while languishing in Salem’s prison. Today Salem Village no longer exists, having been renamed Danvers in an early attempt to erase the dark past of the region. In a delicious stroke of irony, the Danvers Lunatic Asylum was later built on the land once owned by Judge Hathorne, whose great-great-grandson Nathaniel (who added a “w” to his surname so as to distance himself from his legacy) would pen “The House of Seven Gables”, which still stands in modern day Salem. The Asylum, however, burned down in 2007, and the land remains empty except for a cemetery which is consider haunted. RAT GIRL has three more performances. Tickets and info at www.divafest.info. 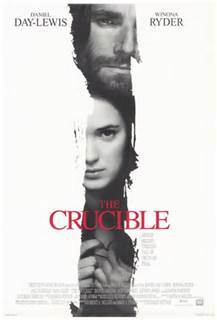 THE CRUCIBLE opens Tuesday, May 20th, tickets and info at www.custommade.org.